Making a Peacock Wreath has been on my list of things to make for a while. Have you ever spotted a craft item that you loved and bought even though you knew it didn’t match your decor? That happened to me when I saw a roll of burlap ribbon with a peacock print. I thought it would be great for a bow, but I wasn’t sure how I was going to use it. I’ve always loved peacock decor, but I’ve never had any in my home. 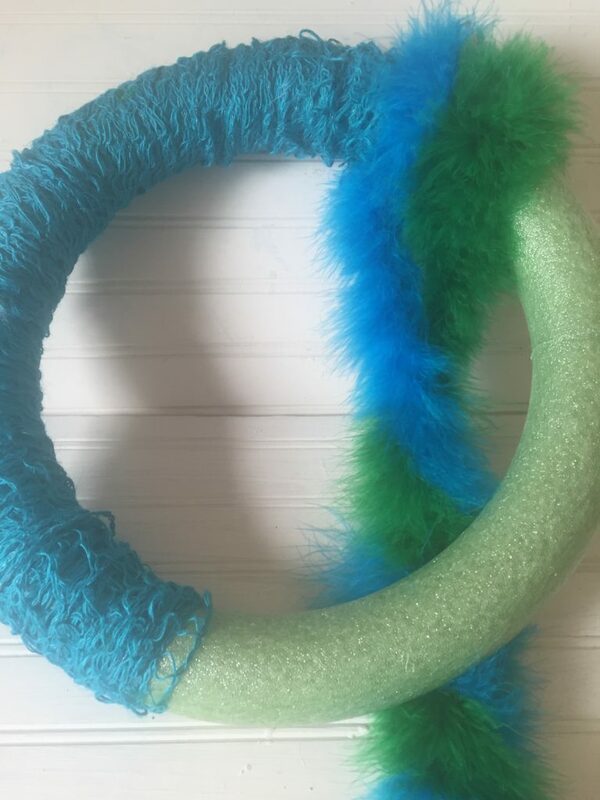 Making this wreath changed that! This is the ribbon I just love! I was surprised to find it at Walmart. 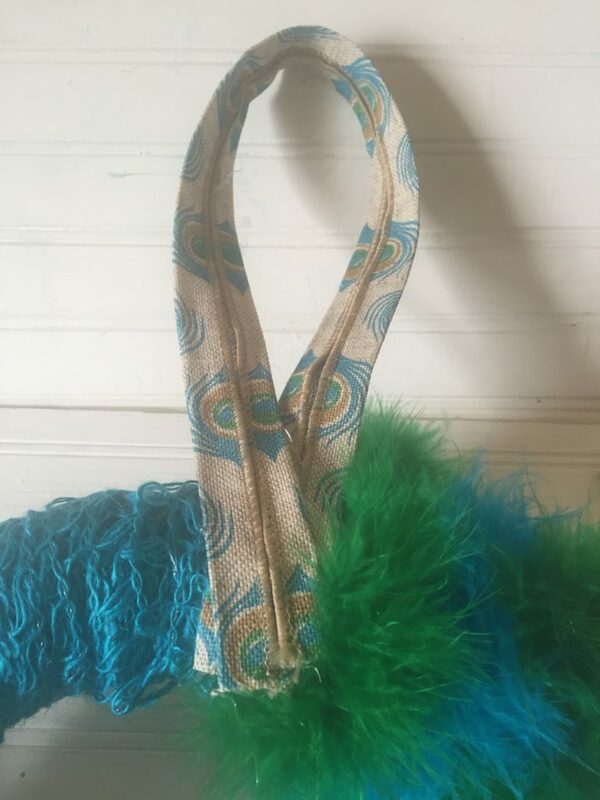 It’s burlap, wired and the peacock design is so pretty. I had to buy it. I spent a little time thinking of how I wanted to use the ribbon. I kept going back to the idea of making a wreath. 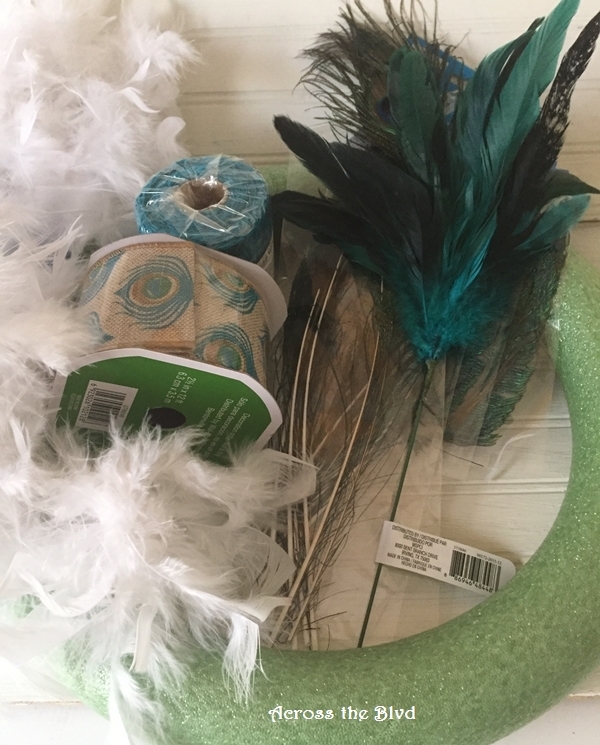 I began looking for peacock feathers and other items to use. I was in a Hamrick’s Fabric store that is closing and everything was marked down with deep discounts. 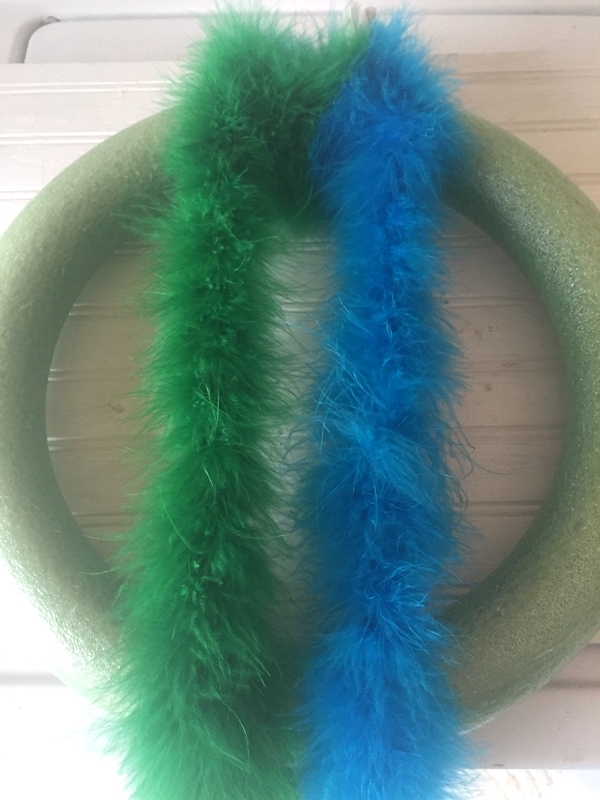 I found these two boas that are the perfect colors for a peacock wreath. I found a roll of wired jute ribbon in a color very close to the blue boa. The roll is 4 inches x 21 feet. It’s lattice patterned, so when it’s scrunched tightly together, it gives a great textured look to the wreath. I tied one end of it around the wreath and then added hot glue to hold it in place at both ends. 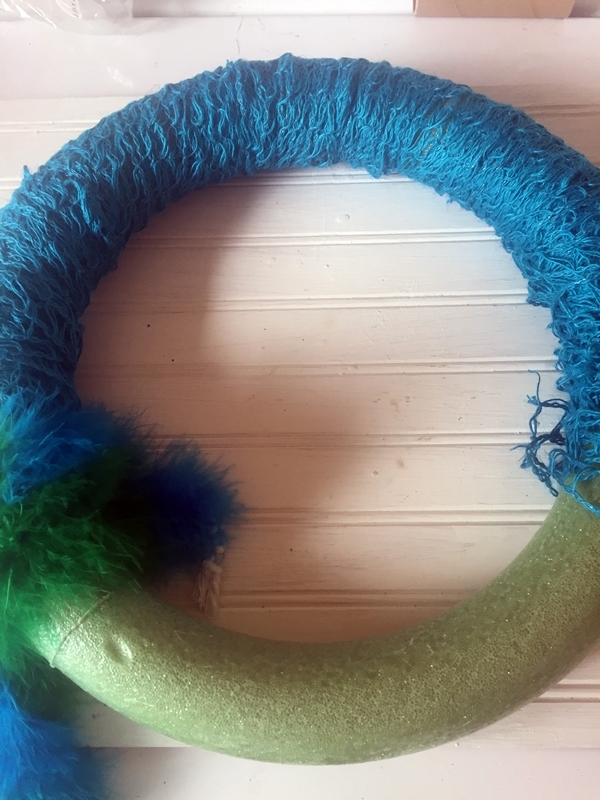 I tied the boas around the wreath at the end point of the jute ribbon. 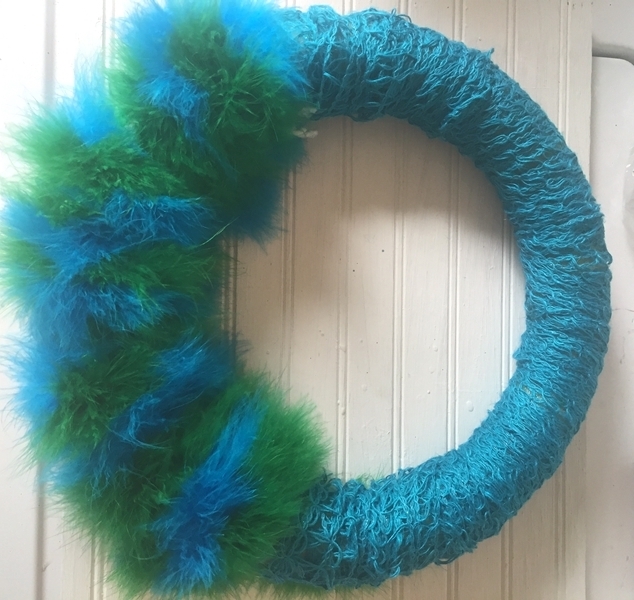 I added a dot of hot glue and twisted the two boas together before wrapping them around the wreath and finished it off with more hot glue. I like the boas, but I was glad that I didn’t wrap them all the way around the wreath. That would have been too much fluff for me. 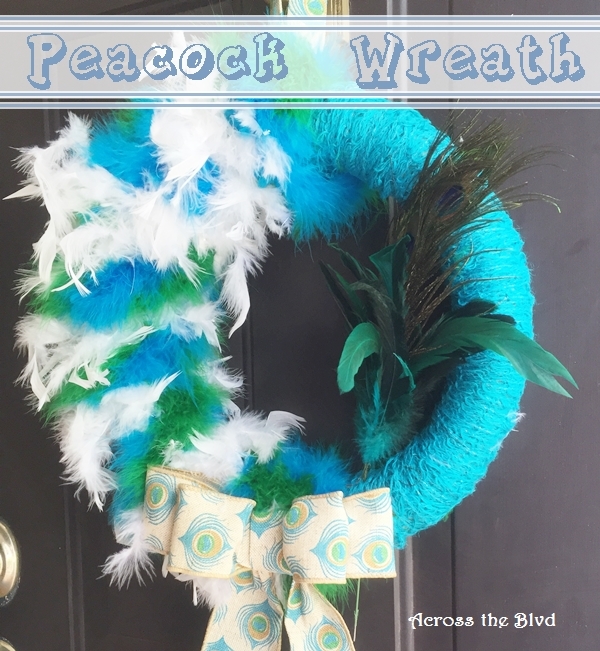 Now, I know peacocks don’t have white feathers, but visually, I thought the wreath needed a contrasting color. I hot glued the white feather strand and wrapped it around the boas. For hanging the wreath, I folded a strip of the peacock ribbon lengthwise to meet in the middle, made a loop and hot glued it to the back of the wreath. I added a square of ribbon to help secure it and to make it look a bit neater. 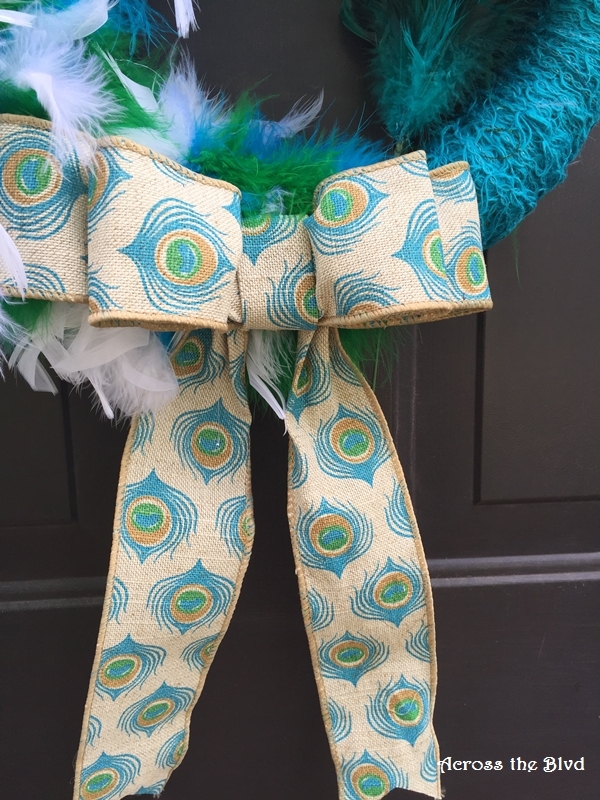 I used my standard bow making technique for the peacock bow. For this one I used the following measurements. 1. Cut strips of ribbon using the following measurements: 10″, 18″, 24″, 26″. 2. Fold the 10″ strip lengthwise to the center. Staple near each end. 3. Find the center point of the 18″ strip, fold to meet and staple together. 4. Find the center point of the 24″ strip, fold to meet and staple together. 5. Find the center point of the 36″ strip and make an accordion fold about three inches long. 6. Place the 10″ strip, staple side up. Add the 18″ loop, followed by the 24″ loop. Place the 36″ strip on top as shown. 7. 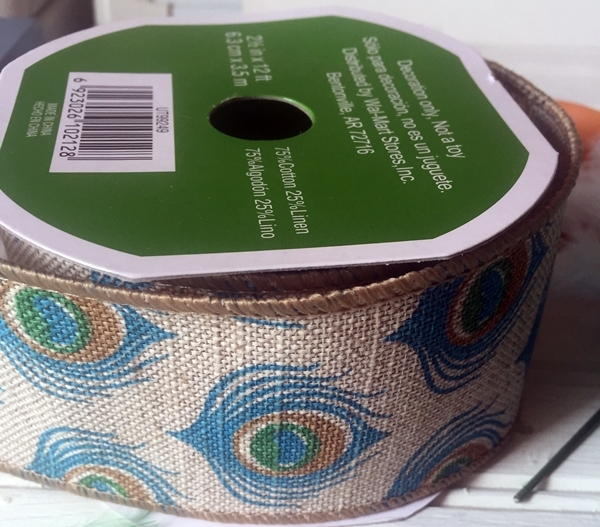 Wrap the 10″ strip around the other ribbons until it meets in the back. Staple it as closely to the ribbon loops as possible. Trim off any excess. 8. Adjust the loops slightly to fluff them out. 9. Trim the tail of the ribbon to desired length. I added hot glue to the back of the bow and held it in place on the wreath for a minute or so. I also added a few pearl head pins to hold it in place. 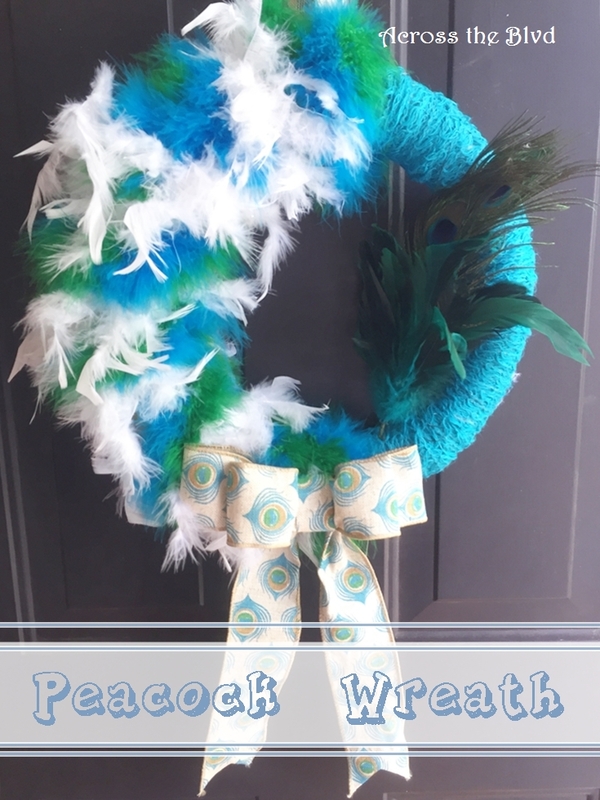 I bought an assortment of peacock feathers, but when I began adding them, the wreath looked too busy. I opted to only use one of them. It’s a pick, so I could just push the wooden pick into the Styrofoam wreath form. This is definitely not a wreath for someone who prefers muted tones, but if you love pops of colors like this, it’s a fun wreath. It all started with just a roll of pretty ribbon that caught my eye! 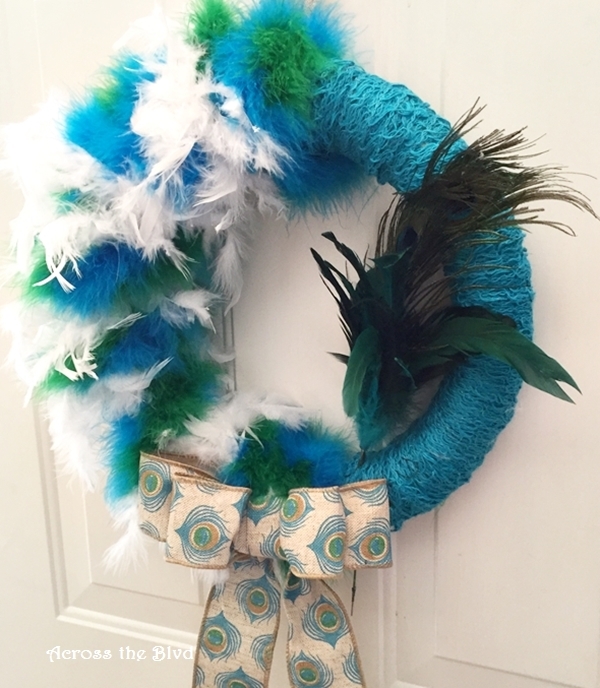 Now, I have a fun, bright peacock wreath to welcome guests. Do you ever create something that is out of your usual decor theme and patterns? It’s not something I do very often, but I enjoyed creating this peacock wreath. Who knows, maybe I’ll start adding in more peacocks to my decor! We party with some awesome bloggers! We’ll be sharing at these great parties! This wreath looks creative and wonderful. Thanks for sharing. Beautiful(!) wreath and great colors!! Wow, what a fun wreath to welcome your guests with. I can see why you were attracted to that pretty burlap ribbon Beverly. It has such pretty tones to it. And the whole wreath is beautiful such an abundance of lovely colors. Thank you for sharing your technique on how to make a bow. This is definitely something that I to know. Pinning! I am so glad you were able to join us at Sweet Inspiration. Thank you, Mary! It was a fun one to make. Bows made that way are really easy and you can make them bigger by just adding more loops. Thanks for hosting Sweet Inspiration! Thanks, Christine! I tend to do that often! Then, I run out of space to store things and come up with a way to use them! Thanks for the fun party each week! This wreath is so unique, and it just totally makes me smile when I see it..what a great way to welcome guests! Thanks, Ginger! It is pretty cheerful! Thanks for stopping by. Beverly, I can see why you fell in love with that burlap ribbon! Love it, but I love the wreath even more! It is so unique and quite stunning! Very beautiful! That ribbon was just too pretty to pass up! Thank you, Laurie! Beverly, I really like your wreath!! 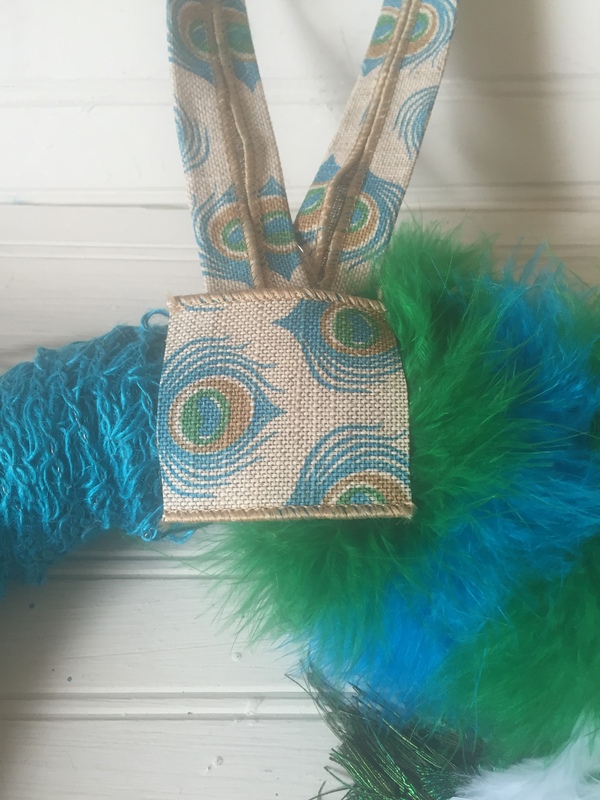 Those peacock feathers are so beautiful, you made a great job using them together with the ribbon. Thank you, Pili! I love how cheerful it looks. It makes me smile! Thanks for hosting the party! I love the way you used the boas! Thank you, Shirley! It was a fun wreath to put together. After reading your comment, I realized I mentioned the wrong store. It’s not Hamricks, it’s a Hancock Fabric. I love peacock colors Your wreath is so pretty and different from any other wreaths, it is just lovely. Thanks so much, Kathleen. It’s definitely different than most of the wreaths I make. 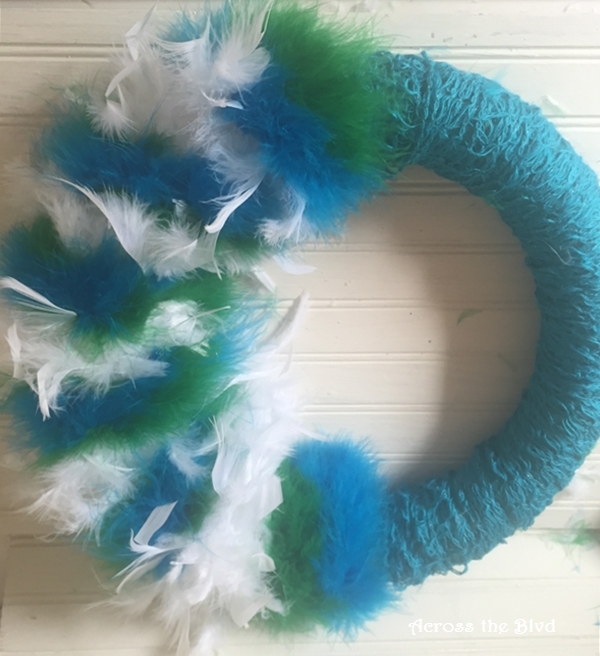 Your wreath is so pretty and looks like it was fun creating! 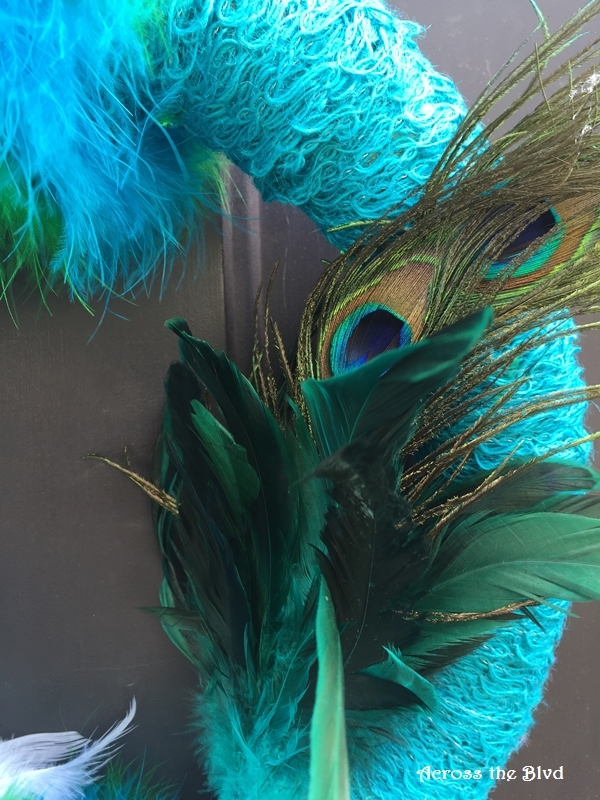 Beverly, you’re absolutely right saying there’s something about the colors of peacock that makes us want them! I saw a lovely tablescape in Pier1 that used turquoise colors that included lovely peacock napkins. I actually picked up the napkins to buy thinking I would make something. But decided against spending the money since it didn’t go with anything I had. Too bad – yours is so lovely! Thanks,Gail! I love those colors. I’m always tempted like that, too. My weakness is glassware. I saw some gorgeous ones at TJ Maxx recently in turquoise and I had to remind myself that I’ve run out of cabinet space for glasses! Thanks, Millie! Yes, there are lots of different color combinations that would be fun to use. I might have to do another one later! Thanks, Wendy! Yes, it is fun how that can happen. I can easily be inspired by little odds and ends like that, too. This wreath is adorable! I can totally relate to buying something because you loved the look even thought it matches nothing…lol! I also have 2 rolls of the jute ribbon and hadn’t thought of using it in this manner. Thank you for the ideas! Thanks for linking up at Funtastic Friday! Thank you, Lacie. I’m happy to have give you some ideas! Thanks for hosting and for stopping by. I adore the colors in this wreath! It’s gorgeous! Please tell your granddaughter I said “thanks!” I’m glad you found the bow making tutorial helpful! Have a great week, Darlene! This is so pretty, I love the bright colors! Thanks for sharing at What’d You Do This Weekend?! Thanks, Joy and thanks for the party!